RSS chief Mohan Bhagwat counters concern that organisation wants to change the Constitution, says we respect it and have never gone against it. New Delhi: RSS chief Mohan Bhagwat Tuesday said the Sangh’s interpretation of Hindutva does not exclude Muslims and was inclusive in nature. “Hindu rashtra (nation) doesn’t mean that Muslims are not part of it. The day we say Muslims are not part of this rashtra, then it will not be Hindutva,” he said on day two of the Sangh’s three-day conclave, Bhavishya Ka Bharat — An RSS Perspective, being held at the Capital’s Vigyan Bhawan. “Whoever lives in Bharat are all of one identity and we call that identity Hindutva. But we have no problem with those who don’t want to call themselves that,” Bhagwat said. “Some don’t say it out of material considerations and political correctness,” he added, claiming that it was Hindutva values, which helped bind a diverse society such as India’s together. The RSS chief also countered the constant apprehensions that it was seeking to alter the Constitution to make it less inclusive, stressing that the organisation abides by and respects the Constitution. “The Constitution is the consensus of our country. Following the Constitution is everyone’s duty. We respect all symbols of the Constitution. We have never done anything against it or the law,” Bhagwat said as he read out the Preamble. “The words secular and socialist were added to the Constitution later, but they are there,” he said. 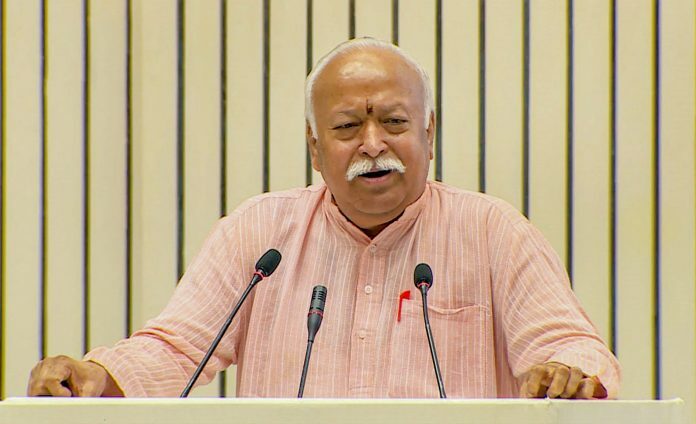 As on day one, Bhagwat spent a considerable time explaining the Sangh’s ideology and its interpretation of Hindutva, while stressing on what the RSS means when it claims India is a Hindu nation. The third day will see him take some questions from a hand-picked audience. Seeking to dispel the prevalent perception that the Sangh was involved in the running of the BJP, Bhagwat went to great lengths to explain that the Sangh was an “apolitical” organisation. In a reference to the BJP, Bhagwat said there was a perception that the RSS plays a major role in the functioning of a particular party because of the presence of many of its workers in it. “It is completely wrong that Nagpur interferes and instructs people in the government. They have more experience than me. They don’t need my advice to do their work,” the RSS chief said. “We give them advice only if they want. It is for other parties to think why swayamsevaks prefer to join only one party”. He also asserted that the RSS has always stayed away from competitive and electoral politics. “We do have a view on national policies, which we express depending on our power. Just because we are not political does not mean we will not talk about issues, like say infiltrators. But we do not influence politics,” Bhagwat said.